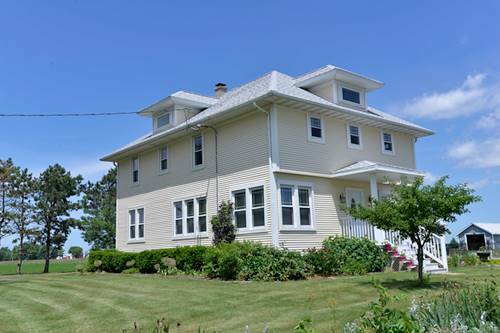 Entertain your friends and family at this updated charming farmhouse. Updates includes furnace and AC (2018), kitchen remodeled (2017), all new windows (2014), roof and siding (2013)...nothing to do but move in and enjoy. Large entry welcomes you into living room and formal dining room. All have original hardwood floors and trim. New kitchen with custom Tri Star cabinets and bamboo floor. Den with full bath..makes a great guest room. 2nd floor features huge master suite with 8x28 master bath including custom shower double vanity, custom cabinetry and heated floor. 2 additional bedrooms and remodeled bath with heated floor. 3rd floor features finished attic with 4th bedroom space. Full basement, great for storage. Beautiful outdoor space features large deck and multiple garden areas with their own sprinkler system. Out buildings include Former dairy barn, corn crib, silo, Machine barn...now "party barn", milk house & your own "she shed". Large 12x24 fenced and sunken, above ground pool. For more information about 18140 W Breen, Elwood, IL 60421 contact Urban Real Estate.